“I can’t find the cables for my hard drive” is a quintessential example of the complaints on most people’s lips when they are frantically searching for the Thunderbolt or USB cables of their portable hard drives. You may have probably had that experience, or perhaps you were planning to go on a road trip with the kids and wanted to pack tons of movies on their mobile devices, but was limited by the storage capacities – which often doesn’t exceed 32GB for most devices, whatever the case may be, there’s always a solution. This is why it’s important to own a wireless portable hard drive. What’s a wireless portable hard drive and why get it? In simple terms, a wireless portable hard drive is a hard drive like every other save for the fact that it uses wireless connections over cables to store your data, unlike the traditional portable hard drives that use lots of cables. The need to overcome storage issues for mobile devices, cameras as well as using the wireless portable hard drive as an “on-the-go cloud storage device with no need for internet connection” makes getting one necessary. Before you get one for yourself, here are a few things worthy of note. Budget and capacity: Is the device within your budget and does the capacity suit your needs? SD card slot: This feature is vital for photographers who intend to purchase a wireless storage hard drive. If it does, great! Battery duration: How long does the battery last? Most of them don’t exceed the 5-10 hours range. Maximum devices that can be connected at a time: How many devices can access the storage device at any given time? It’s pertinent to note that wireless storage devices use a pass-through technology that allows it connect to your local Wi-Fi network. In essence, you connect to the wireless storage device which in turn connects to your router, ensuring you can still use the internet while you access your files on the drive. Without further ado, below is a rundown of the very best wireless portable hard drives. 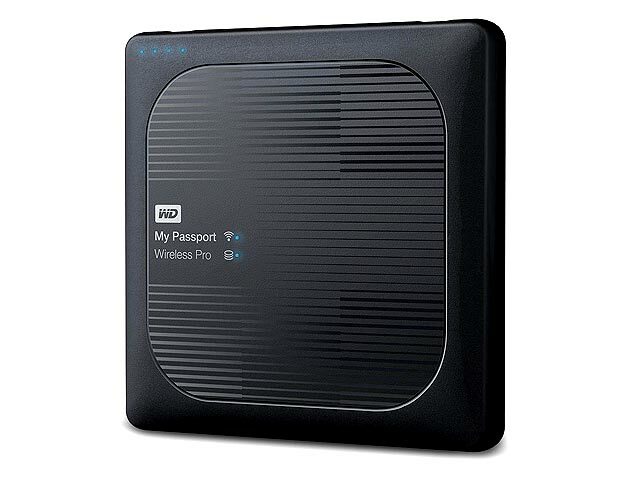 Top on our list today is Western Digital’s popular mobile wireless drive which has been pretty much around. With over 5 hours of usage time under its hood, this device which comes in 500GB, 1TB, and 2TB storage capacities can also be used as a normal external hard drive through its USB 3.0 ports. Its SD card slot comes in handy for photographers who need immediate backup on the field. Up to 8 connections are supported by the drive and different light colors on the battery bar indicate the battery level – blue for full, green for 75%, amber for 50% and red for 15% or less. The drive is compatible with iOS, Android, Windows and Mac and is shipped with the WD My cloud app. Unlike other wireless portable storage devices, the WD My Passport Wireless supports dual stream Wi-Fi channel which even though it sacrifices battery life, gives faster Wi-Fi speeds. Downsides of the drive include its lack of support for some media file types and it’s somewhat confusing mobile app for first-time users. 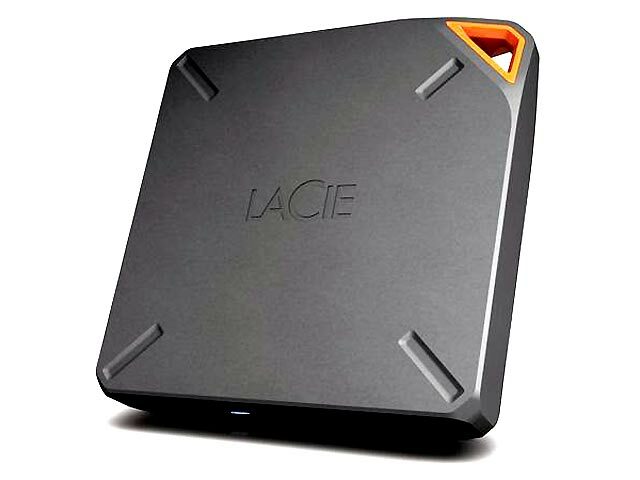 Shaped like a gasoline jerry can, the easy to use LaCie Fuel is another great portable wireless storage option. Like the WD My Passport Wireless, the LaCie Fuel can be used as a normal drive using the USB 3.0 port. It supports 5 devices at a time and has a storage capacity of 1TB and is compatible with iOS, Android, Mac and Windows devices. You can also back up your files on Dropbox from the drive which has more than 10 hours of battery juice within its cells. One more thing, it’s not that aesthetically appealing. Seagate, the company who also made the LaCie Fuel Wireless Portable Hard Drive didn’t forget to join the train of wireless storage device makers. 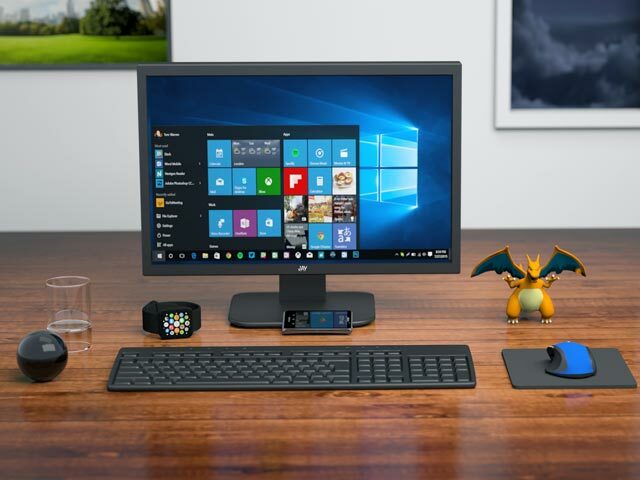 Sporting 10 hours of battery life and the ability to connect up to 8 devices (streams only to 3), the Seagate Wireless Plus is compatible with Mac, Windows, iOS, Android, Amazon Kindle Fire as well as game consoles and other devices which are DLNA (Digital Living Network Alliance) compatible. 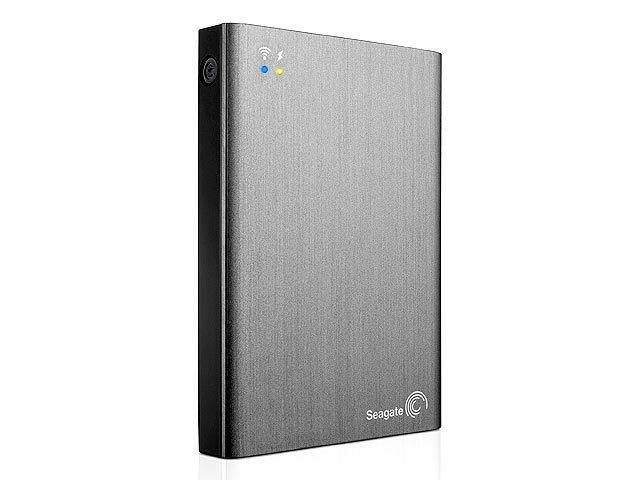 Available storage capacities are between 1TB and 2TB and it comes bundled with the Seagate Media App. Surprisingly, this device has no major downsides save for the fact that it doesn’t support some file types and would require you to install third party apps to access and use the unsupported file types. More so, transfer of large files is better done using the USB 3.0 port since its wireless transfer speeds are a little slower. A pretty compact portable wireless drive which contrasts with its “Buffalo” name, this mini-station with 500GB and 1TB storage capacities efficiently connects up to 8 devices at once. Like the aforementioned devices, it supports iOS and Android with its Buffalo Air 2 App while it can be connected to your computer using the USB 3.0 port. 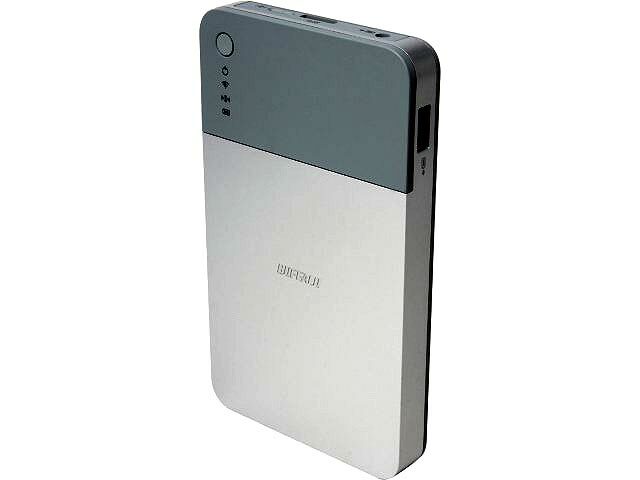 Battery life is twice that of the WD My Passport Wireless with over 12 hours of usage time to its credit. One major glaring downside of this wireless storage devices is the drive’s inability to organize files by type. That notwithstanding, the Corsair Air offers 1TB storage and connection support for 8 devices as well as a Gigabit network port (which comes in handy when you want to use it as a NAS server) and up to 7 hours battery time. Unlike the aforementioned drives which allow for only 3 devices to be connected when streaming HD videos, the Corsair Voyager Air supports HD video streaming for up to 5 devices without flinching. What’s more? 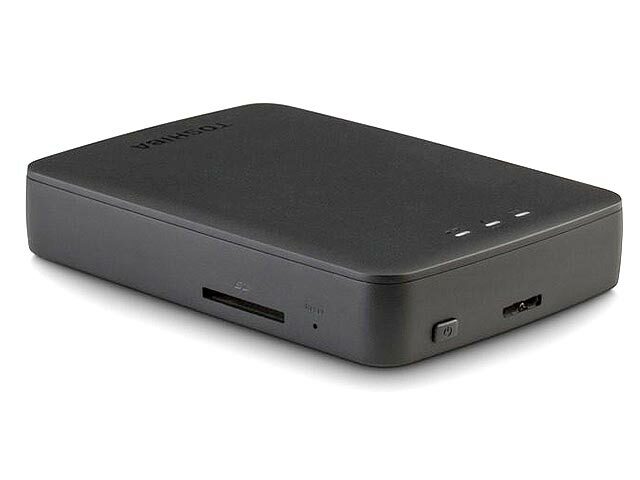 It can be used as a portable hard drive when connected to a computer via its USB 3.0 ports – works on USB 2.0 devices too. Even though it’s aesthetically not appealing with its bulky design, the Canvio Wireless Portable hard drive makes up for that as it comes equipped with an SD card slot, USB 3.0 connectivity, and is compatible with Windows, Mac, iOS, and Android powered devices. It also allows simultaneous connection to the internet whilst connected to your device using the pass-through technology earlier mentioned. Battery life on the Canvio isn’t too good, however, as it sits on just about 4 hours. 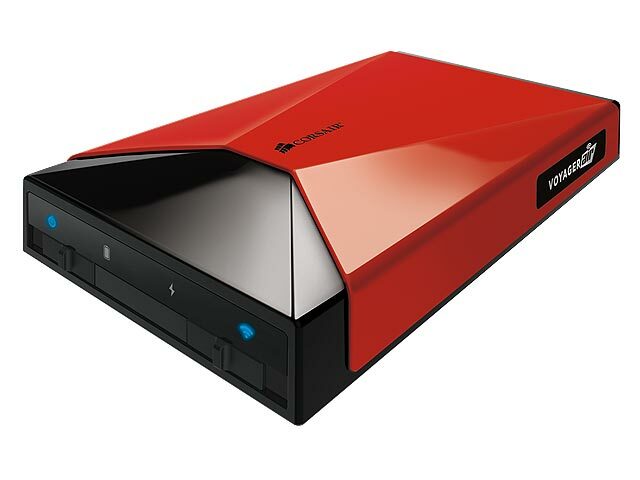 Aside from that, the Toshiba Canvio Aerocast Wireless Portable hard drive seals the deal. Getting a wireless portable hard drive shouldn’t be such a herculean task, given the fact that various devices abound to meet your needs and specifications. There’s at least two years warranty for most drives on the market today. I can’t even count the times I have been looking for my portable hard drive cables. They seem to dissappear along with my car keys. I think these are great options that you are reviewing. I would really look into getting me one of those. That Corsair Voyager Air looks great and the specs are close to what I need. Just a question. I know wireless technology is brilliant these days, but won’t you lose data if not using a cable and what happens if the battery power runs out halfway through data transfer? – if you were saving bunch of small files, than some of them will be saved and will not disappear and another part will not be saved. Wow, I didn’t even know that these existed, to be honest. I normally see the normal portal hard drives, but this is the first time that I’ve ever seen a wireless portable hard drive. Thank you so much for the information. Going to have to invest in one of these products so I can keep all my files backed up.